The Account Information page allows you to identify important and helpful information about your organization and your Planned Maintenance account. Comptroller shows the user currently listed as the Planned Maintenance Comptroller. The Purpose Code you select will automatically populate on your planned maintenance work orders created by Planned Maintenance. Planned Maintenance is most commonly selected here. 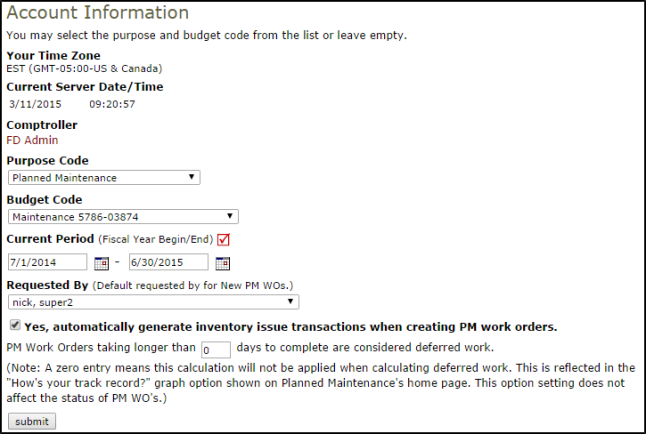 In the Budget Code drop down menu you can select a budget code that will automatically populate on all of your PM work orders that are generated by Planned Maintenance. If you have a designated budget code allocated for planned maintenance work, select it here. Select a user in the Requested By drop down menu that you would like listed as the Requester for all new PM work that will generate from Planned Maintenance. Check the box to Yes, automatically generate inventory issue transactions when creating PM work orders if you also own our Inventory application. This will allow your PM Schedules with inventory items listed in Step 13 to automatically create an Inventory Issue Transaction when the PM Work Order is generated. If you have our Inventory application and do not check this box, then any inventory items listed on your schedules will come through as Inventory Requests rather than Issue Transactions.